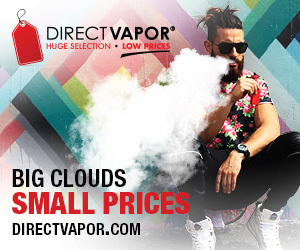 Huff and Puffers joins the Seven Report family of review product suppliers with the latest addition to the very popular SMOK TFV tank series, the TFV12, dubbed the “Cloud Beast King.” One can only imagine what they’ll call the TFV16, if there ever is one. I’ve been using SMOK TFV tanks since November 2015, first the TVF4, then the TFV8. They are among the highest rated pieces of hardware, and the highest rated tanks, that have ever been reviewed by Seven Report. In fact, wife is still using her original TFV4 as her daily vape. With each new version of the tanks SMOK increases the airflow and the inner diameter of the drip tip to provide even more vapor. The biggest change is in the coils that produce all that vapor. 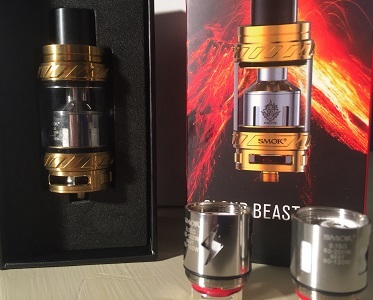 The TFV12 comes with three coils, a 0.12 ohm V12-T12 Duodenary Coil (duodenary means 12) installed in the tank, and a 0.15 ohm V12-X4 quad coil, and a 0.15 ohm V12-Q4 quad coil. 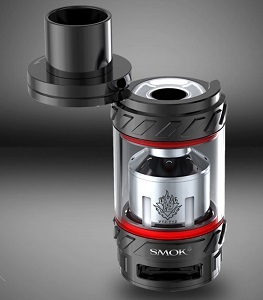 In addition to the TFV12 and the three coils, SMOK includes a spare glass tube, a tank band and spare O-rings and gaskets. SMOK also offers a variety of other coils for the TFV12. The V12-T12 has a suggested wattage range of 60 – 350 watts with a “Best” range of 130 – 200 watts. 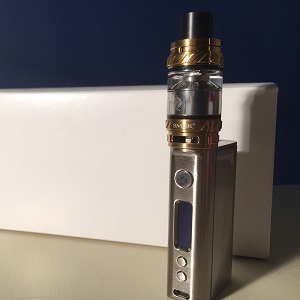 SMOK describes this coils as “Cloud vapor chasing.” The suggested wattage range on the V12-X4 is 60 – 220 watts with a “Best” range of 100 – 170 watts. It’s described as “Brings deep and rich cloud taste.” The V12-Q4, “Brings smooth taste,” and has a range of 60 – 190 watts with a “Best” range of 90 – 160 watts. SMOK kept the traditional TFV top rotary fill design. Simply twist the top of the tank in the direction of the arrow on the top cap and drip your ejuice into the slot on the top of the tank. When using a new coil drip some ejuice into the center of the coil and onto the cotton that’s visible through the ejuice ports. 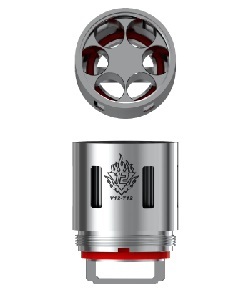 The TFV12 has a capacity of 6 ml. The airflow control is located at the base of the tank. I left the V12-T12 Duodenary Coil in the tank, opened up the tank, primed the coil and filled the tank with Strawnana Smoothie ejuice from Vapes Gone Wild. I put the TFV12 on the Kangertech KBOX 160 and allowed the coil to soak for about 10 minutes. With the KBOX 160 set to 130 watts, the bottom end of the “Best” range for this coil, and the airflow about ¾ open I gave it a first vape. Vapor and flavor production were tremendous, with the strawberry notes of the ejuice really starting to pop. I then took the wattage up to 150 watts and adjusted the airflow to about half open. The vapor got noticeably warmer and the strawberry was really coming through. Then I backed the power off to 140 watts. The vapor got just a little cooler and I started to notice more of the banana flavor. On all of the other TFV tank coils I’ve used there has been a short break-in period with just a little of the cotton taste coming through for the first few minutes of vaping. That taste was almost non-existent with the V12-T12. I’ll be using the SMOK TFV12 extensively over the next week or so and will then post a full, in-depth review. Follow Seven Report on Twitter or Facebook to be notified when that review is live. Huff and Puffers has the SMOK TFV12 available for $32.99 in silver and $34.99 in black or gold. You can find out more about it and order one here.